The Gunvault SpeedVault Safe allows you to rapidly access your pistol, while still keeping your firearms safely locked up. Constructed from solid 18 Gauge steel, the SpeedVault can be mounted easily in a variety of places such as beneath a desk or table. 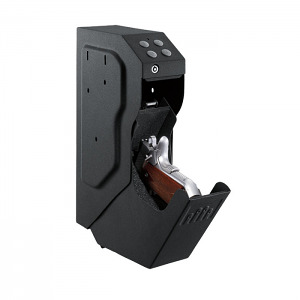 Features a protective foam-lined interior, tamper resistant door and audio and LED low battery warning. Mounting hardware included. Outer dimensions: 13.0"L x 3.5"W x 6.5"H.